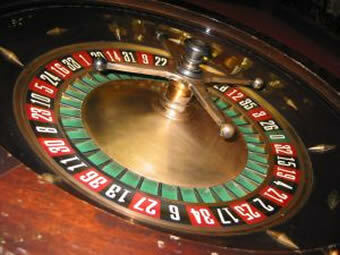 Learning how to play the fascinating and popular casino game of roulette can be as exhilarating as it is intimidating. So what is the best way to play roulette and win? Find out here by reading this in-depth article! With experience comes some improvement in your winning chances. That's why it's really important to make sure to have a better understanding of this game along with all the betting rules long before you commit your money to the table. It has been said that with experience will come confidence. It is this characteristic that can enable you to play carefully and wisely while enjoying the game so much more thoroughly. This www.casinoandsportstalk.com article sets out arguably what has to be the best way to play roulette combined with the game's basic rules, traits and betting strategies to create an experience that is enjoyable and fulfilling to the player. When a new player is faced with a busy roulette table with its confusing array of squared off numbered zones and betting areas, a croupier busily moving chips of varying denominations around and taking everyone's bets, not to mention the rather intimidating numbered wheel itself, it is not uncommon to be somewhat overwhelmed by it all. Therefore, the first unspoken rule of the game is to simply stand back a while and watch others play to see what they are doing before taking the plunge yourself. It is by watching how other players interact with a busy table that you will gain an insight into where the majority of the bets are placed. You'll also start to see how the croupier works his magic with so many chips being placed in what at first would appear to be a haphazard and chaotic mess! There are many different ways to win other than choosing the exact number the ball lands on, as you will see. The majority of rules are the same for the main two versions (European and American) of the game. They mostly centre around betting and the different kinds of bet that can be made, since there is no player skill involved in this game of chance. In brick and mortar casinos (and live games online), the croupier's job is to take bets and pay out winnings. Before the wheel is spun, he will call "No more bets" signalling that no more chips can be placed. In the online version, the issue doesn't exist as you must have placed your bet before the game will start. Below is an explanation of the different kinds of bet that you can make at the roulette table, whether at a brink and mortar or online casino. There are two main groups of bets available at the roulette table. These are classes as "outside bets" and "inside bets". 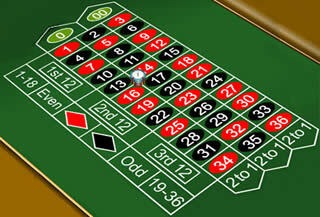 Outside bets refer to the boxes outside the main group of numbered squares and are meant for betting on larger groups of numbers. Inside bets refer to placing chips within the main box of numbered squares on individual numbers 1 through 36 plus 0 and 00; or smaller groups of two, three, four or six numbers with different odds corresponding to each bet. The simplest kind of bets are the ones with 1:1 odds that will pay out even money, meaning if you bet a pound you will win a pound if the ball lands on the corresponding number group. However, with evens bets, if the ball lands on the green "0" (or "00" on a US wheel) you lose. A slightly better payout can be obtained from going for a one of the 2:1 odds bets, where you bet a pound to win £2. If the ball lands on a number in the group corresponding to the box you have your chips placed, you win. Column Bet: Place your chips in one of the three boxes that you'll find at the ends of the three long rows of numbers labelled "Columns: '1st' '2nd' '3rd'." These cover the groups of 12 numbers in each "column"
If you're looking for better odds, you'll need to place your chips on one of the "inside bets" which we'll look at here. Working out a viable strategy for playing roulette is made fairly simple thanks to the fact that there is no player skill required to influence the outcome of the game. It is purely a game of chance and therefore there is nothing a player can do that will alter the outcome. Doubling your bet after each loss is a long believed mathematical strategy that, while theoretically correct, does not work in practice. This is because of the way numbers escalate in value rapidly as you continue to double them. The reality is that you will invariably reach the table limit or simply run out of money long before your wager doubling system bears any fruit. Many believe that if a red comes up several times in a row, the odds of a black coming up on the next spin of the wheel are greater. The fact is that every spin is independent of the previous spin, so there is an even chance of red or black coming up no matter how many times one or the other may have won in previous spins. The same goes for any combination of numbers. Every instance of a number or group has the same chance of winning on each new spin as it did on the previous one! A good strategy for managing your bankroll will be much more fruitful than trying to follow any strategy. By being sensible about how much you are willing to bet each time and avoiding hot headed or rash decisions, you can prolong your game and enjoy it all the more. Now that you have a good insight into the best ways to play online roulette, I'm pretty sure you'll want to try out your skills and knowledge at the table for real. There are many online casinos that offer the main types of roulette game, but it is a great advantage to be recommended to good establishments that are trustworthy and secure while having a good reputation among players. To set you on the right path, I can recommend a short list of these better casinos that are well worth spending time getting to know. For your convenience, I'll provide two lists. One contains casinos that accept US players and the other contains those that are Europe facing and do not accept US players. Unfortunately, we have chosen not to display those online casinos that accept US players until the US laws on Internet gambling change to a more favorable stance. Please accept our apologies and take a look instead at the list of portals that accept players from around the world including from those countries where gambling online is legal and accepted. 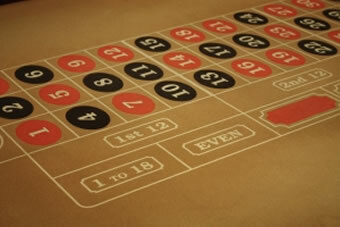 In the end, the whole reason to play roulette should be for enjoyment and never as a way to make a lot of easy money. The gambler's fallacy will beat you in the end and if you are gambling with money that you cannot afford to lose, you run the risk of getting yourself into real financial difficulty. Always set aside a limit to how much of your bankroll you will spend on any one visit to the table and stick to it no matter what.